When you’re designing your website, you have to make sure you make a good first impression on your consumer. You only have ten seconds to leave a good first impression and tell consumers what they will get out of your company’s website. If you don’t get them interested within this small time frame, they’ll click away. 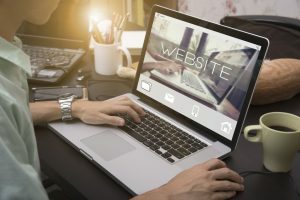 Consumers might not always recognize the hallmarks of a well-designed website, but they’ll certainly recognize the work of a beginning or amateur web designer. Here are the most common mistakes beginning web designers make that you should be on the lookout for. Sometimes when web designers start, they don’t always know what makes for a visually pleasing layout. Websites created by these designers are fairly easy to spot; they often use bright colors or odd font choices, and it’s not always immediately clear where to find important information. While it’s important to have a bit of fun as you design your website, it’s essential to keep in mind what the end result is going to look like. Avoid visual chaos by picking colors that won’t distract visitors on your website, and make sure your color schemes match. Also, be sure to choose fonts that are legible. You want to make sure visitors are able to read your website’s content easily and clearly. Even if an amateur web designer knows how to make a website look appealing, it’s likely they don’t have a full understanding of how internet marketing and search engine optimization work. These web designers tend to design visually appealing websites, but don’t create content that’s relevant to what visitors are looking for on a search engine. If there is relevant content present on the site, there’s likely not enough of it. A good looking website is important, but a website that doesn’t provide high-quality content isn’t going to get you more customers. Make sure you use proper SEO and internet marketing tactics to draw in more visitors to your website. If you want your website to be both visually appealing and optimized for high rankings on search engines, contact MRN Web Designs. MRN Web Designs can create a well-designed website that will draw in users with relevant, high-quality content that turn clicks into customers.